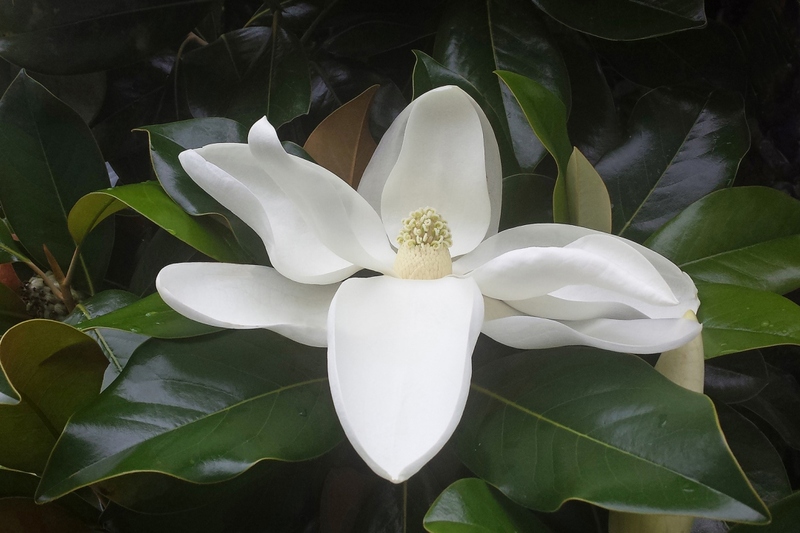 Southern magnolia (Magnolia grandiflora): growing, planting, caring. The most common species of magnolias. 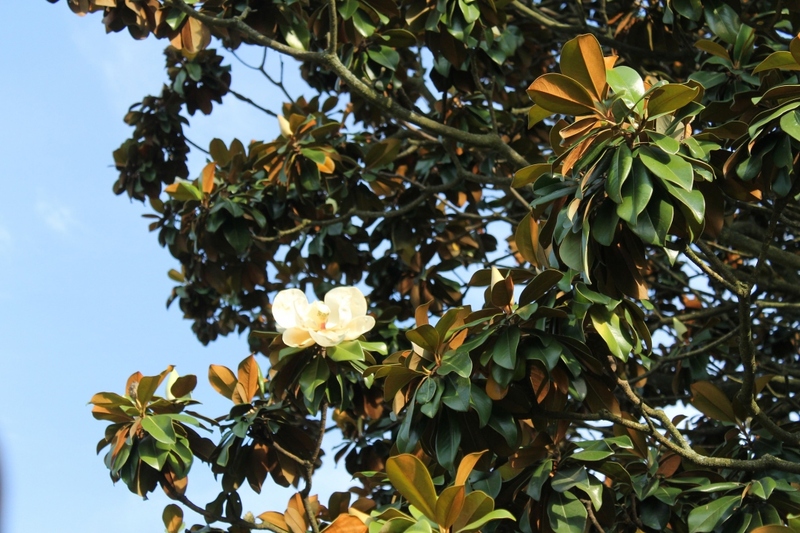 Magnolia grandiflora is a large evergreen pyramidal-shaped tree growing to 37 m (120 ft) tall with simple and broadly ovate, dark green leathery 14–22 cm (5–8 in) long leaves with smooth margins and showy scented white flowers. Over 50 cultivars have been developed. Magnolia is a medium sized tree, cultivated for it's delicate flowering that precedes the appearance of leaves. The leaves are large, alternative and generally leathery — they may be oval or elliptical, and deciduous or evergreen. The solitary flowers are large, often straight, very decorative and generally in the shape of a cup. The perianth is made of six to nine petal-like tepals (indifferentiated petals and sepals) that come in light pink, yellow and white. The numerous stamens are in the form of scales. The carpels are situated in a cone on the bract. The Magnolia genus comprises approximately 110 species, almost all trees and shrubs, from warm, temperate regions. Plant your magnolia at the start of autumn to encourage root growth before winter, or plant in spring for evergreen species. In any case, avoid periods of freezing. In any case, choose a location that is neither too hot in the summer, nor too humid in the winter. Look for good-quality, rich forest topsoil — it can even stay moist in spring. Magnolia likes light sun exposure or partial shade, with shelter from prevailing winds. Don't break the plump roots and do no bury the root ball too deeply! Plant in a hole at least two times bigger than the root ball. Spray water on the roots before planting. This will greatly improve the chances of growth, no matter the conditions. You can create a basin around the plant, which will be used for watering the first months. Pack the soil well around the roots (don't hesitate to use all of your weight). Water generously, completely filling the basin. Protect the base from the bite of frost for the first few winters, and protect in any case from dryness in the spring! You may use pine needles or pine bark to maintain the necessary level acidity levels of the soil. By the way, if you magnolia flowers poor or doesn't flower at all, remove some soil until you get to the roots, then refill with peat. The first weeks, keep a good hygrometry by douching the foliage with a fine mist in the evening, and sprinkle waterfully once a week. Indeed, for the watering of the shrubs, it is better to carry out generous watering infrequently, to encourage the root system to fetch water deep underground. It's therefore suitable to water until the planting basin is full and only empties slowly. Magnolia's most defining characteristic is it's natural shape! It's important to maintain this shape without unbalancing the branches. Because of this, pruning is theoretically unnecessary. However, if you still wish to reduce, balance or remodel the branches, to save garden space for example, you may do so just after flowering, or in autumn. Magnolia is mostly resistant to diseases and parasites, but keep an eye out for slugs and some fungi, one of which, Pestalotia, is particularly nasty. Finally, excess limestone in the soil may result in chlorosis. To protect against slugs that attack young plants in particular, put anti-slug measures in place — mazes of ash, beer bottle traps... Pestalotia is a fungus that will completely remove the foliage from the plant, and appears most often in over-calcareous soil. Give your plant some air, and elements to acidify the soil — pine needle mulch, or peat — before it's too late! Finally, in case of excess calcium, magnolia may suffer chlorosis on it's leaves. The leaves will turn yellow and your magnolia may end up withering away. Chlorosis is caused by overly high concentrations of limestone in the soil. Test your soil, and give it what it needs to make it more acidic!